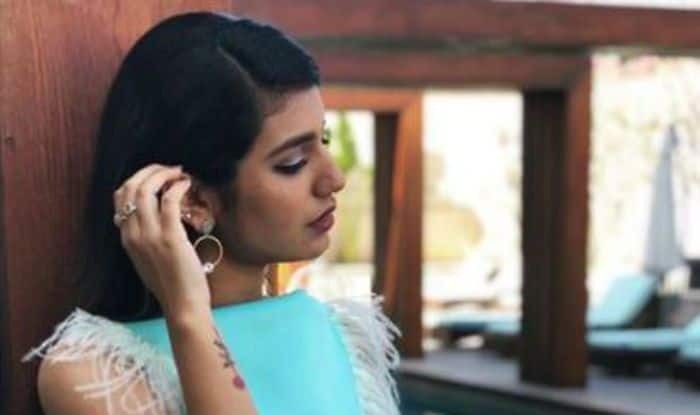 Malayalam actor Priya Prakash Varrier has become a national crush after her winking video went viral on social media. She made a place in everybody’s heart and still reigns with her beauty and bold avatar. Lately, she took to Instagram to share her picture in blue separates and looks vibrant, as usual. In the picture, she is seen donning blue crop top teamed up with a blue skirt. She has accessorised her look with a pair of earrings, finger ring, subtle makeup and her pose game is bang on. Her look is from the promotions of ‘Lover’s Day’ at Hyderabad and she definitely rocked the look like a boss. Earlier, she posted a picture with South superstar Mohanlal and every fan can easily relate to her feeling. In it, she can be seen beaming with happiness as she stands next to the actor. Dressed in a black striped paint paired with a denim jacket, she looked gorgeous as always.